Derby Downtown LLC shows preliminary plan for Factory St.
Click image for a much larger image. 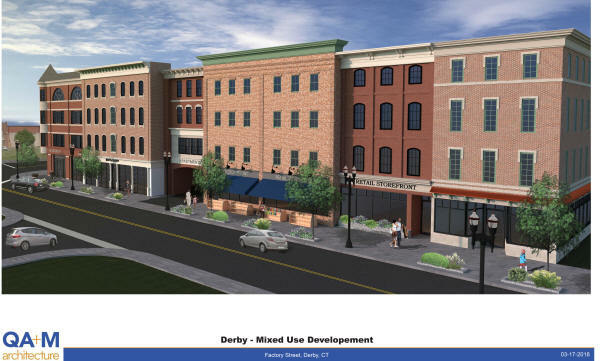 On April 17, 2018, Derby Downtown LLC presented preliminary plans to the Planning Sub-Committee of the Planning and Zoning Commission City of Derby to develop a multi-use residential and commercial complex, Factory Street Square, created to attract young millennials and empty nesters. The proposed initial building complex will feature 300 one to two-bedroom unit apartments in a 3 to 4-storied building with retail stores, an eclectic mix of restaurants, and office units on the ground floor. Apartment leasing agreements will include amenity packages with access to high-speed Wi-Fi, indoor golf simulator, health club, in-complex library, bike racks, dog-sitting-walking-grooming services, and possibly a rooftop garden and community spaces. The Factory Street Square mixed-use complex is proposed to offer easy commuter access to Routes 8, 95 and the Merritt Parkway, plus the Bridgeport-New Haven-Waterbury rail lines. Hiking, walking and biking recreational trails are nearby and will add unique advantages to this distinctive location. The predominant property in the development is owned by Jena-Bonazzoli-Barretta and Christopher M. Barretta Sr. who have partnered with family members and developers Jim and Steve Lepore to create Derby Downtown LLC. The Barrettas have owned the property for almost 10 years and operate Barretta Landscape and Gardens out of the Factory Street location. Representatives of Derby Downtown LLC stated, “Since 2005, the City of Derby has been working diligently to revitalize their once-industrial downtown. The upcoming improvement to Main Street/Route 34 in this area will demand a large-scale residential complex that offers affordable, modern rental units and attractive lifestyle for today’s young and retired Connecticut residents. Factory Street Square is the result of the City of Derby demolishing structurally unsound, long-neglected 19th-century buildings beginning in 2003. In 2005, the City’s Redevelopment Agency adopted a 14-acre area south of Main Street known as the “Business Revitalization District” which removed blighted buildings with the intention of making the area an ‘active residential mixed-use community. Derby Downtown LLC representatives commented, “Our proposed Factory Street Square multi-use complex fits perfectly into the City’s vision of bringing a youthful vibrancy, and a convenient and affordable style of living. In addition to the easy access to Routes 8 and 95, the commuter rail service, and fixed-route bus connections, the complex offers a much-desired wealth of amenities all within a beautifully-designed neighborhood. Derby is the hub of the largest metropolitan area in Connecticut with its borders reaching New Haven, Bridgeport and north to Waterbury, plus it is just a one-hour drive to New York City. The popular Derby Greenway Trail is easily accessed from the proposed Factory Street Square. The developers are looking forward to receiving public comment as the proposal works through the various City of Derby boards and commissions.